After discovering this by accident for myself recently I am wondering how some here come up as on this personality test as it could shine some light on some of us here . There is some free tests online for those who didn't know anything like myself. Personality tests change with time, so I'm not sure if that's useful. My personality changed from 20 years ago (young and in my first employment) to 7 years ago (another employment, recently married) to 4 years ago (my first son was born). I'm the same person, but some corners have softened and others sharpened... and entire parts from my soul blew away. I don't feel the same person. Guess what, I had misjudged the title of this thread for some kind of obscure PC hardware showing up in eBay! DosDaddy wrote: Guess what, I had misjudged the title of this thread for some kind of obscure PC hardware showing up in eBay! I did a test for it. said something about me being the fixer type and said I was like Harrison ford. I'd put this in the trash pile too. Might be useful for the extreme left and fascist Nazis type. I know they like to label types of people and separate them. 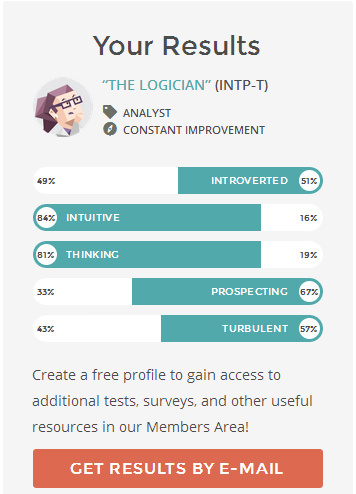 I'm a logician, INTP-T. Perhaps that's the reason my employees often call me eccentric. MBTI types are horoscopes for nerds. Don't put any stock into them whatsoever. Unfortunately the test doesn't really reveal a thing about anybody. It's just simple, open questions addressing a number of scenarios and people getting classified according to the way they'd presumably respond in said situations. There's no deeper analysis or accounting for absolutely anything else as far as I can read. Anyways, we ought to be careful about these tests. Not that they are "dangerous" by themselves but many people have the tendency to resort to them as a way of pumping up their pride, looking to be aided in thinking too highly of themselves as if they were unique or above average, which probably isn't the case for most of us. DosDaddy wrote: Anyways, we ought to be careful about these tests. Not that they are "dangerous" by themselves but many people have the tendency to resort to them as a way of pumping up their pride, looking to be aided in thinking too highly of themselves as if they were unique or above average, which probably isn't the case for most of us. We should be careful about uncritical thought for sure.